WACS instituted the WACS Teacher of the Year program to promote the position of Christian school teacher and to honor the dedication involved in the ministry of Christian education. Those in education know that it is the classroom teacher who is daily in the "trenches" training the hearts and minds of our young people. Accolades for accomplishment or service will often be given to the pastor and administrator. It is the purpose of this program to highlight the efforts of the classroom teacher. Each WACS school may nominate one elementary teacher (K4 through grade 6) and one secondary teacher (grades 7 -12). The nomination form is due in the WACS office by Monday, September 17. This years' winners will be chosen by an impartial committee. The winners will be announced during the final general session of the WACS Educators Conference on Friday, October 12. They will each receive a plaque and a small gift. Congratulations to the teachers that received the Teacher of the Year honor at our 2017 Educators Conference. Click here to read more about Mrs. Jan Martin from Trinity Baptist School. 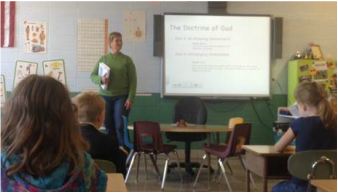 Click here to read more about Mrs. Janet Garrison from Calvary Baptist Christian School. Congratulations to the three teachers that received the Teacher of the Year honor at our 2015 Educators' Conference. Click here to read more about Mrs. Shelly Roth from Bay City Christian School. Click here to read more about Miss Leah Stevens from Utica Christian School. Click here to read more about Mr. Chris Tachick from Faith Christian School. Mrs. Jeanette Terpstra from Faith Baptist School in LaCrosse, WI was one of the WACS Teachers of the Year. Click here to read more about Mrs. Terpstra. Mrs. Lin Leeds from Trinity Baptist School, Fond du Lac was the other recipient of the WACS Teacher of the Year award. Click here to read more abo﻿ut Mrs. Leeds. The Elementary Teacher of the Year Award was presented to Miss Karen Teasdle from Waukesha Christian Academy in Waukesha, WI. Click here to read more about her. Mrs. Nancy Schuyler from Calvary Baptist Christian School in Watertown received the Secondary Teacher of the Year Award. Click here to read more about her. The Elementary Teacher of the Year Award was presented to Mrs. Barb Fizz from Bay City Baptist School in Green Bay. Click here to read more about her. Mrs. Heidi Braugler from Maranatha Baptist Academy in Watertown received the Secondary Teacher of the Year Award. Click here to read more about her.